Unemployed man wins £81,000 on the lottery; young man, in excruciating pain from slipped disk - facing months out of work - miraculously healed in one week; a motorcyclist's life is saved by the voice of an angel. Whether we are aware or not, says author Simeon Kalesh, angels surround us every moment of our lives. They rarely intrude directly - usually only in an emergency - and most of us live without any awareness of their presence. But as the spiritually awakened know, angels will intervene frequently in our life - always for our good - if we acknowledge them and seek their blessing. Why live without help from such supernatural beings? Some of us need all the help we can get: now we can have it! There are all kinds of angels: some are omniscient and omnipotent, wielding amazing power, whilst other play a more specific and intimate role in the spiritual life of the individual. Either way, you can receive the bountiful blessings of the angelic world! A lad was in a state about his impending exams. He had studied hard, but was still convinced he would fail. But he passed with top marks. He had called on the angelic spheres and during the exams he received the most incredible sharpness of mind and memory-recall! An elderly lady had read spiritual books all her life and had always believed in angels, but felt that she was never blessed. She despaired: the author urged her to try this formula. At 84 years of age, she became a changed person. Her ailments lessened and became fuelled with the optimism that she may yet have many more years to live. Angels tend to specialize. Some particularize in literature, studies, tests; others are concerned with health disorders. Yet others concern themselves with affairs of the heart. A wife was shattered by her husband's liaison with a young girl. He was besotted with her. She turned to the angelic spheres to bless her marriage and end her husband's foolishness. Overnight, he lost interest in the girl and their marriage improved. A young man found himself in debt. Credit card companies were at his throat. Either robbing a bank or a 'miracle' seemed to be the only solution. The latter occurred, thanks to the appropriate angel. Never before had he entered a lottery, for he knew the jackpot odds were millions to one. Even so, he won £32,000 - £5000 more than he needed to clear his credit card debts! ANGELS NURTURE AND PROTECT US WHEN WE ALLOW THEM TO ENTER OUR DAILY AWARENESS. The process for this is simple. No Elaborate rituals are involved. THEY CAN MAKE THE DIFFERENCE BETWEEN SICKNESS AND HEALTH... BETWEEN LIFE AND DEATH! A lad on his motorbike heard a voice telling him to swerve... he automatically obeyed... he happened to be on a sharp bend with a car approaching on the wrong side! Simeon Kalesh's work deals with the so-called 'major angels' - those who wield great power - and 22 'inner angels' who can alter the way we feel about ourselves and other people. A middle-aged woman had been house-bound for years... not because of illness, but from an inexplicable terror of open spaces. Nothing had helped her. But when she learnt there was a specific angel for people afflicted by agoraphobia, claustrophobia and similar conditions, she turned to him for help. She now goes out every day without fear or anxiety. Her life has completely changed, she is a new person. A man was desperate for a job promotion. But so many others wanted the vacant position, he didn't think he stood much of a chance. There is an angel whose speciality is careers. He believed; he got the job. The angelic sphere can help you find your place in the world. It can shield you from violence. Angels can inspire you, give you aspiration, bring peace of mind. They can usher love and happiness into your life. They can get you out of trouble. 'Miracles' are their speciality! All religious faiths believe in angels; so do mystics, occultists, and so on. There is no disagreement as to their existence and purpose, but how to get them to intervene regularly in one's life is the problem. That problem has been solved by Simeon Kalesh whose whole life has been lived in angelic awareness. 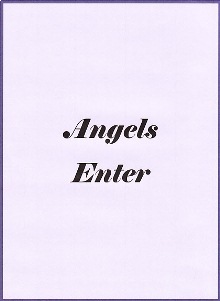 Once you have read this publication you will feel 'open': it is 'angels enter'. Your spirit will feel warm. You will glow with faith and optimism, no matter what your circumstance.